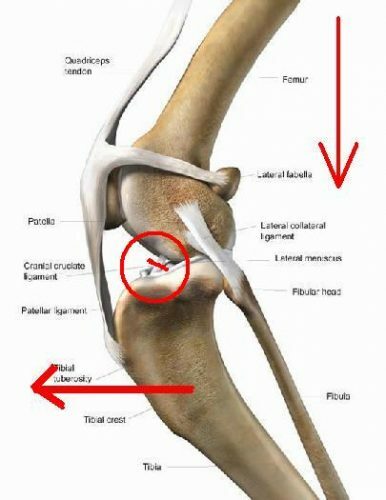 Did you know that Anterior Cruciate ligament injuries occur in dogs the same as they do in humans? This is a blog about Cruciate Injuries in dogs, the most common orthopaedic problem we see in dogs. It’s a bit of a MEGA BLOG, as it will cover THE WORKS – What it is, Why it Happens, How it’s diagnosed, Treatment options, and Prognosis. I’ve included some pictures to try to help illustrate some bits as well. The Dog’s knee is a very complex joint. See the picture. For some quick anatomical background – The Femur (thigh bone) has a rounded bottom end. – The Tibia (Shin Bone) has a flat top end. – A Crescent shaped Meniscus on each side of the top of the tibia, acting as shock absorbers. 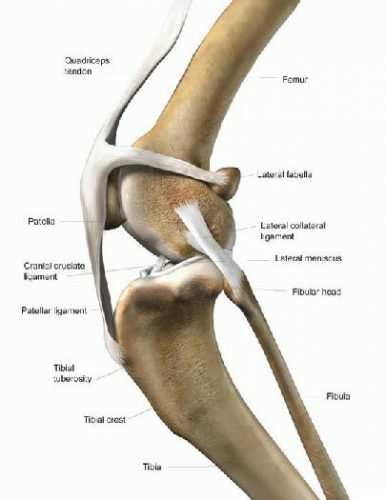 – And ligaments – One on each side of the joint, the ligament from the knee cap, and the ANTERIOR (or CRANIAL) and POSTERIOR (or CAUDAL) CRUCIATE LIGAMENTS inside the joint itself. How does the ligament get damaged? Dogs can either completely rupture the ligament suddenly while running, or they may partially rupture the ligament over a longer period of time. This is often due to the dog having a steep angle of their tibia, leading to constant straining of the ligament, until it ruptures. 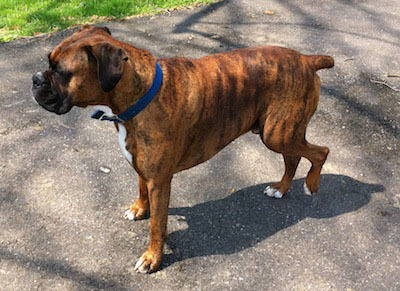 Dogs will present with varying levels of lameness of the affected back leg, usually either just toe-touching the ground, or bearing weight with a limp. The dogs are sore because of the INSTABILITY leading to STRETCHING of the joint capsule. With a sudden, complete rupture, dogs may be happily playing in the park or beach, then yelp, and hold their legs up . Dogs with partial cruciate injury will often be lame at the start of exercise, seem to warm up out of it, but then stiffen up once they cool down. How is a Ruptured Cruciate Ligament Diagnosed? When a dog comes in for assessment of lameness, we give them a full examination to make sure there is nothing else going on. We then examine the sore leg by assessing all of the bones and joints, looking for pain, swelling, or any other abnormalities. We specifically test for ANTERIOR CRUCIATE INJURY by testing for CRANIAL DRAW LAXITY, and performing a TIBIAL COMPRESSION TEST. These tests indicate the knee joint has a cruciate ligament deficiency. Ligaments do not show up on x-rays, so we can’t diagnose cruciate ligament rupture with normal x-rays (humans have MRI scans to show up ligament damage). We do take x-rays in order to assess the joint for arthritis, and to rule out other bone diseases. Because the joint has become unstable from damage to the ligament, we aim to try and improve the stability using surgery. 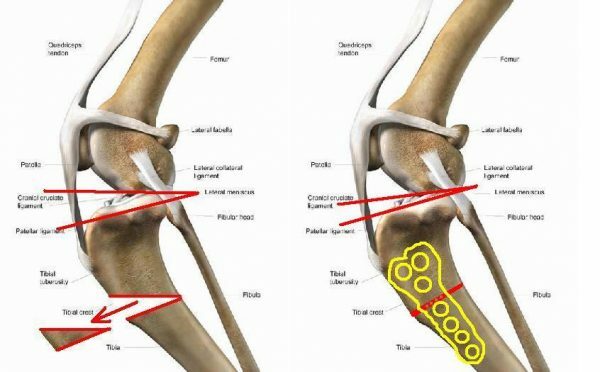 The reason for trying to improve the stability is try and SLOW THE PROGRESSION OF ARTHRITIS within the joint, and ALLOW RETURN TO FUNCTION sooner in the affected leg. Without surgery, the joint will develop more arthritis sooner, and the dog will be more painful. There are 2 Different Surgeries we perform for dogs with cruciate disease. This procedure involves the placing of an implant on the outside of the joint to provide the stability the Anterior Cruciate Ligament used to provide. The implant stops the forward movement of the shin bone, and also rotates the shin bone outwards a bit. This procedure involves taking a wedge out of the shin bone, to allow a reduction in the angle of the knee joint. By reducing the angle, there is no longer cranial movement in the joint, so you no longer need the cruciate ligament. The bone is then held together with a specialised plate and screws while waiting for the bone to heal. With both procedures, we look into the knee joint to check the internal structures, particularly the Crescent shaped Meniscus that can become damaged when the Anterior Cruciate Ligament is damaged. We remove the damaged part of the meniscus as well as the remnants of the damaged ligament. WHICH PROCEDURE FOR WHICH PATIENTS? We generally recommend the ECR surgery for all patients smaller than 20kg, as the success rate in these patients is very good. We recommend the TWO procedure for larger dogs, as this generally leads to the dogs’ weight bearing faster and having a quicker recovery than the ECR. 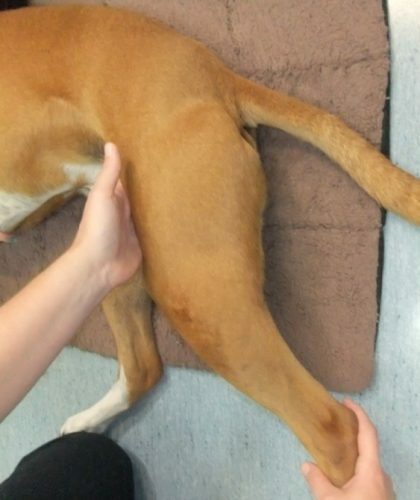 In larger dogs the ECR procedure, while still having a high success rate, does tend to lead to a greater amount of arthritis forming in the joint post operatively, and also larger dogs tend to take longer to start weight bearing on the leg. The TWO, due to the complexity of the procedure, the specialised implants and equipment required, is more expensive than the ECR procedure. This series of X-rays is a Pre Op, Post Op and Follow Up from a dog having had a TWO procedure. Note the gap in the bone in the second image, that has fused in the third image. After the surgery, the main aim is to get the dog weight bearing on the leg as quickly as possible. When dogs don’t use their limb, the leg muscles wither away, which means they are less likely to use the leg, even though the joint is stable. There are several things we do to help prevent this and to improve our chances of a successful outcome. We use potent pain relief medications to help to reduce post operative pain in our patients. We use a combination of potent Pain Killers and Anti-Inflammatories for a period of 2 weeks – longer if required. Pentosan injections are a medication that helps to improve the health of the joint fluid within the joints, helping with pain and trying to slow the process of arthritis within the joint. The injections are given as a weekly course for 4 weeks, then a booster every 3 months. We strongly recommend rehabilitation sessions after cruciate surgeries on our patients. We have nurses that have undertaken extra training to provide rehabilitation sessions at the clinic. These involve a combination of massage and exercises, and the nurses show the owners how to continue at home. We remove the sutures from the surgery site after 14 days. The first 2 weeks after the surgery is strict confinement, with dogs being confined and only walked on lead for toileting. Weeks 6-9 continue increasing from 500 metres to 2 kilometres. We hope that at 12 weeks after the operation the dogs are walking the same distance as they were before the operation , and starting some off lead exercise. SWIMMING can be a really good way of exercising the leg without the concussive force of walking – this can be started after the sutures are removed. As the dogs are not doing much exercise after the surgery, it is important to feed them less – otherwise they will put on weight, putting more pressure on their joints. 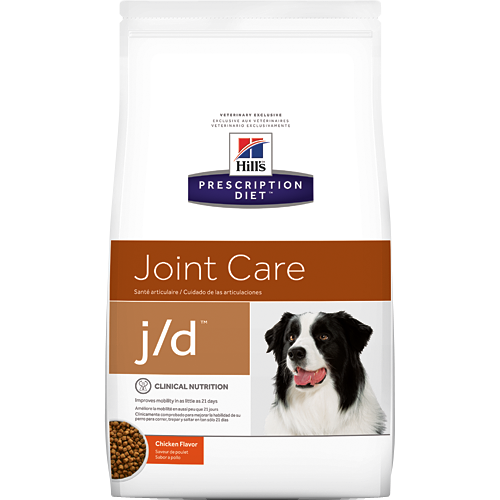 Often we recommend Hill’s J/D diet to have the dogs on long term, as this prescription diet helps to reduce the production of arthritis within the joints and improve the health of the cartilage cells. The dogs are checked weekly (weeks 1-4) initially while they are having Pentosan injections and rehab sessions. We have another check a month later (week 7-8) to see how the leg is going. For dogs that have had a TWO, this involves sedation and repeat x-rays to ensure the implants are OK and the bone is healing well – see the pictures of the X-rays above. What is the dog’s PROGNOSIS? The prognosis with either surgery is very good, with vast majority of dogs progressing as planned and getting back to normal exercise at the 12 week mark. A small number of dogs may have complications, with implant failure (plate breaking or screw loosening – approximately 1%), infection (2%), refusing to walk on the leg (less than 1%) being some that we see. Dogs that have ruptured one cruciate ligament are at a Moderate risk (40-50%) of rupturing the ligament in the other leg – meaning the other leg will likely require repair as well. 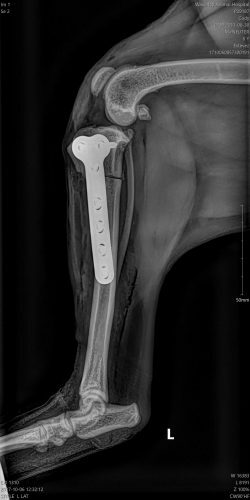 Implant failure and infection with the TWO procedure has the potential to be very serious, given the fact that the procedure involves removal of part of the bone, if the implant becomes unstable, the dog basically has a broken leg – thankfully, this is a rare complication. The VAST majority of cases having a TWO go according to plan, and get back to normal exercise after 3-4 months.